When you stay at Hotel Chopin in Fiumicino, you'll be near the airport, within a 15-minute drive of Fiera di Roma and Parco Leonardo. 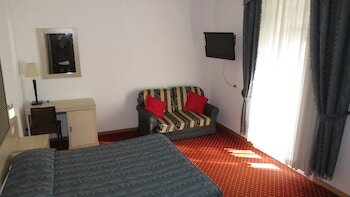 This hotel is 4 mi (6.5 km) from Ostia Antica and 15.8 mi (25.4 km) from PalaLottomatica. You can enjoy a meal at the restaurant serving the guests of Hotel Chopin, or stop in at the snack bar/deli. Buffet breakfasts are available daily from 6:30 AM to 10:30 AM for a fee. Featured amenities include a business center, a 24-hour front desk, and multilingual staff. For a surcharge, guests may use a roundtrip airport shuttle at scheduled times and a ferry terminal shuttle. Make yourself at home in one of the 40 air-conditioned rooms featuring LCD televisions. Complimentary wireless Internet access is available to keep you connected. Private bathrooms with showers feature complimentary toiletries and bidets. 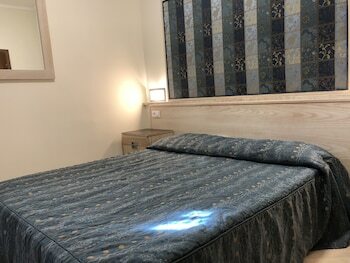 Conveniences include phones with free local calls, and you can also request cribs/infant beds (complimentary). The following fees and deposits are charged by the property at time of service, check-in, or check-out. Fee for buffet breakfast: EUR 5 for adults and EUR 5 for children (approximately) Airport shuttle fee: EUR 6 per person (one-way) Extended parking fee: EUR 3.8 per night The above list may not be comprehensive. Fees and deposits may not include tax and are subject to change. You'll be asked to pay the following charges at the property: A tax is imposed by the city: EUR 2 per person, per night, up to 10 nights. This tax does not apply to children under 10 years of age. We have included all charges provided to us by the property. However, charges can vary, for example, based on length of stay or the room you book. All guests, including children, must be present at check-in and show their government-issued photo ID card or passport. Cash transactions at this property cannot exceed EUR 2999.99, due to national regulations. For further details, please contact the property using information in the booking confirmation. This property offers transfers from the ferry terminal and train station (surcharges may apply). Guests must contact the property with arrival details 24 hours prior to arrival, using the contact information on the booking confirmation. We understand that sometimes your travel plans change. We do not charge a change or cancel fee. 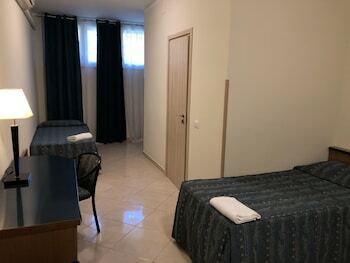 However, this property (Hotel Chopin) imposes the following penalty to its customers that we are required to pass on: Cancellations or changes made after 11:59 PM ((GMT+02:00)) on Apr 26, 2019 are subject to a 1 Night Room & Tax penalty. If you fail to check-in for this reservation, or if you cancel or change this reservation after check-in, you may incur penalty charges at the discretion of the property of up to 100% of the booking value.